Bob fell in love with this FLW design on a wall clock. We learned that it was adapted from the Exhibition typeface, developed by Wright for use on exhibition drawings. Each letter was constructed mechanically, using only 45 and 60 degree slant lines and two compass curves. 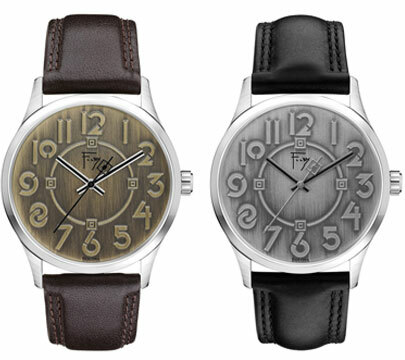 It looks great on these two watches – the antique bronze dial watch is on a dark brown leather strap, while the antique silver dial watch is on a black leather strap. Stainless steel case, and includes its battery.